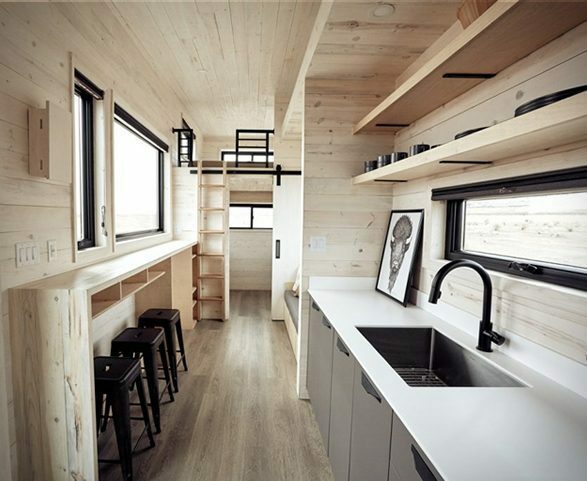 We love every single type, style, method and choice of tiny homes here at Van Clan, and with housing prices at an all time high there really is no better time than now to think about downsizing into a tiny home. It doesn’t matter if you tow it, climb up into it or parachute down to it; if it’s tiny then we’ll take it. 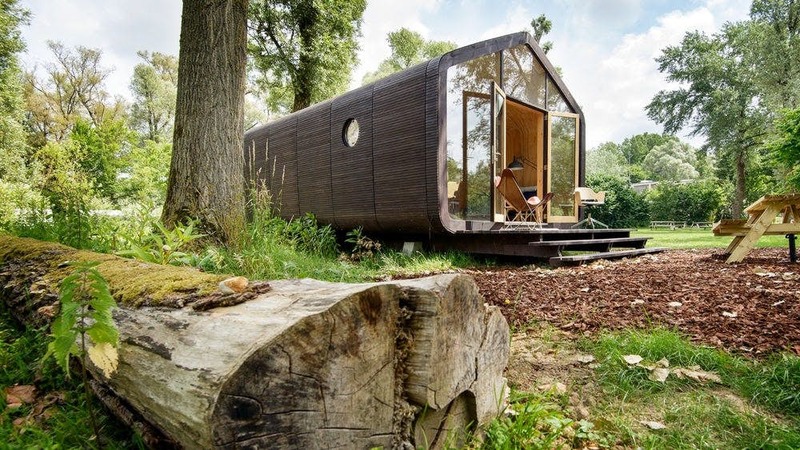 We’ve made a list of the top tiny homes that we’ve found whilst traversing the cyber plains (searching the internet) that will make you want to give your house keys to a stranger and run headfirst into the woods. 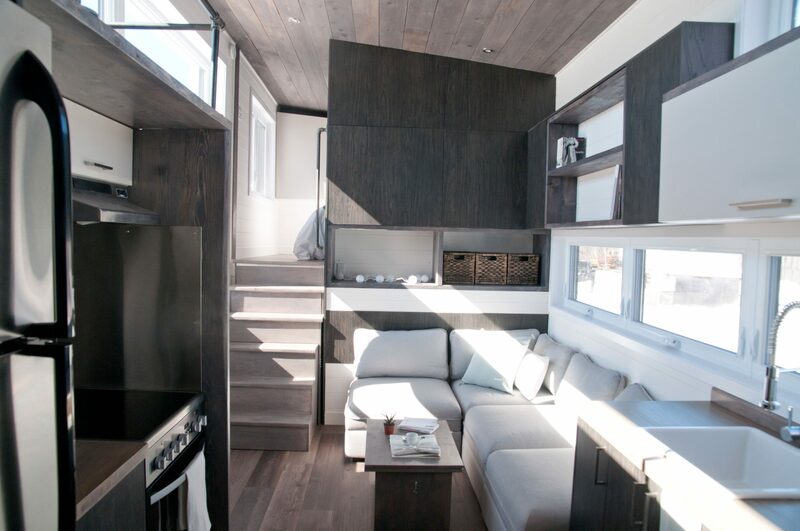 If you’re after a luxury tiny house on wheels that can handle the toughest terrain then the living vehicle from Hoffman should be first on your top tiny homes list. With everything from a washing machine and full working shower to a decking area and a kitchen sink, this tiny house has everything that you could possibly need for either a luxury weekend away or an off grid living experience in the mountains. The living vehicle comes with a whole heap of extras that you can add onto your build to truly customise your new home, and because it’s on wheels you never have to get bored of the view outside your window! 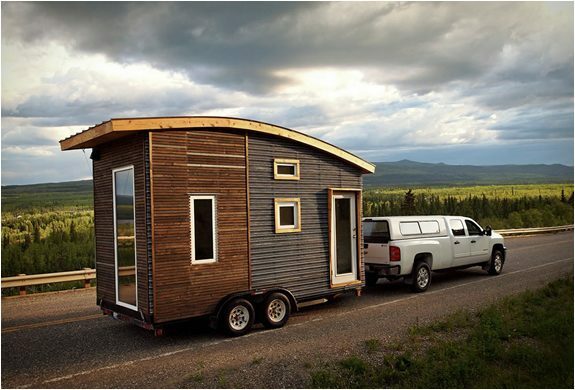 Check out our full article on this amazing tiny house here! If you’re looking for top eco campers then number two on our list of top tiny homes might interest you. 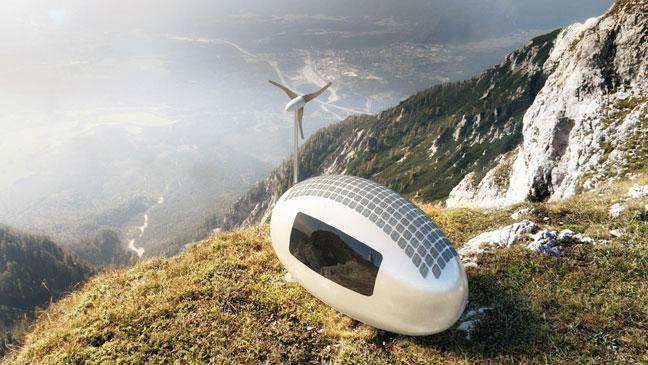 Welcome to the home of the future; a non slip egg that’s powered by wind! This green machine has a built in wind turbine and solar cells on the roof, both of which power up a large battery that gives you power even in the worst conditions. 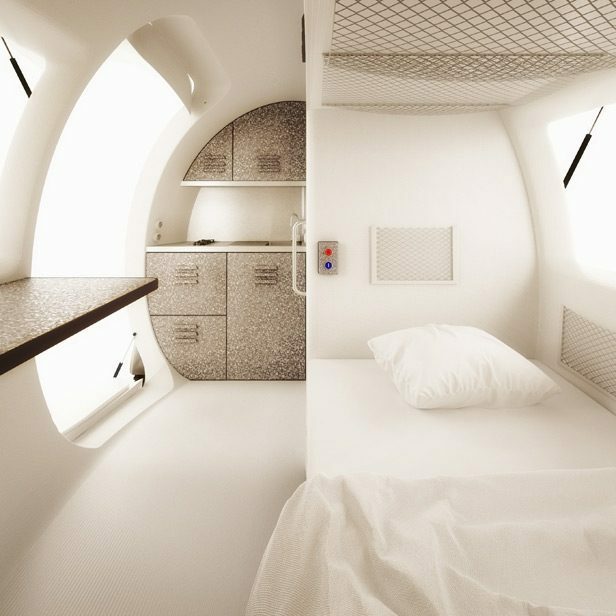 The inside of the Ecocapsule is pretty simple, but they always say that ‘a home is what you make it’. The greenest addition of our tiny homes list comes complete with a hot shower and a flushing toilet, and seen as though you’ll be collecting your own rain water you can shower and flush to your hearts content. If you’re searching through tiny homes in search of a luxury log cabin then the Wikklehouse will be right up your street! This hand made house from furniture makers Fiction Factory is a ‘prefabricated dwelling made from cardboard’. They make each Wikklehouse by carefully wrapping 24 layers of cardboard around a rotating house-shaped mold, and then they finish it off by adding a layer of waterproof foil and some lightweight wooden cladding to make it stronger and increase its longevity. You can hook up to the grid, but if you’re like us and enjoy getting away from it all you can fit solar panels and a composting toilet and really cut down on your outgoings. Prices start at €30’ooo, and you can check out more information on the this eco home by visiting the Wikklehouse website. If your looking for a house that can withstand harsh winters then the Sakura from Minimaliste should be on your list. 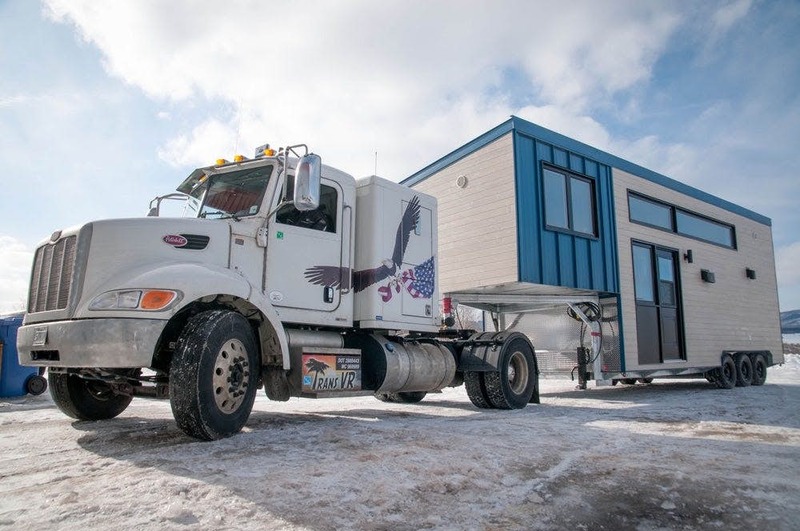 It’s made our top tiny homes list because it can keep you alive in temperatures of minus 40 degrees celsius, and also because it’s being pulled by a massive lorry! 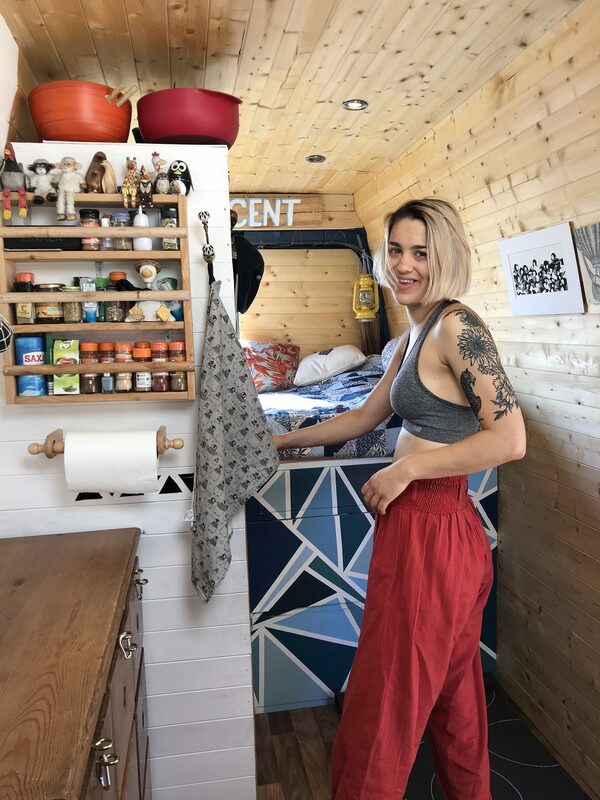 This cold proof tiny house comes with a rooftop terrace (get your thermals out) a fully equipped living room, a kitchenette and bathroom a composting toilet as standard and a stack of van life essentials. A staircase takes you up to a cosy bedroom, and you can access a loft space via a pull down ladder. The Sakura utilises hydronic radiant underfloor heating and a fancy ventilation system with heat exchangers, so that your toes (and your insides) can stay toasty in the harshest of conditions. 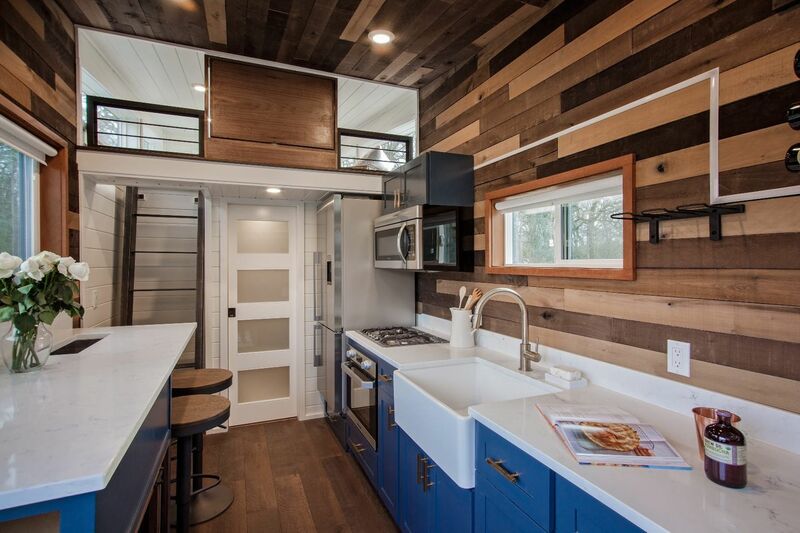 Say hello to the The Breezeway, a 32-foot tiny home built by Tiny Heirloom. It’s one of the only top tiny homes in our list that strives to include the outside as part of the inside, and it does it by having large rolling shutter as it’s main entry point instead of a small conventional door. It might only be a simple design feature, but the mental change that you go through from stepping from a big space to small one is seriously reduced because of it, which can only be a good thing! Bedrooms can be found in both sides of the butterfly winged roof, and the long kitchen area is fully kitted out with a cooker, microwave, belfast sink, breakfast bar and any other accessory that you might need in order to throw the worlds best off grid party/hangover chill out sesh. You can buy your very own Breezeway for around $44’000, and you can either get one exactly like the pictures above or create your own quirky design! Check out the Tiny Heirloom website to learn more. 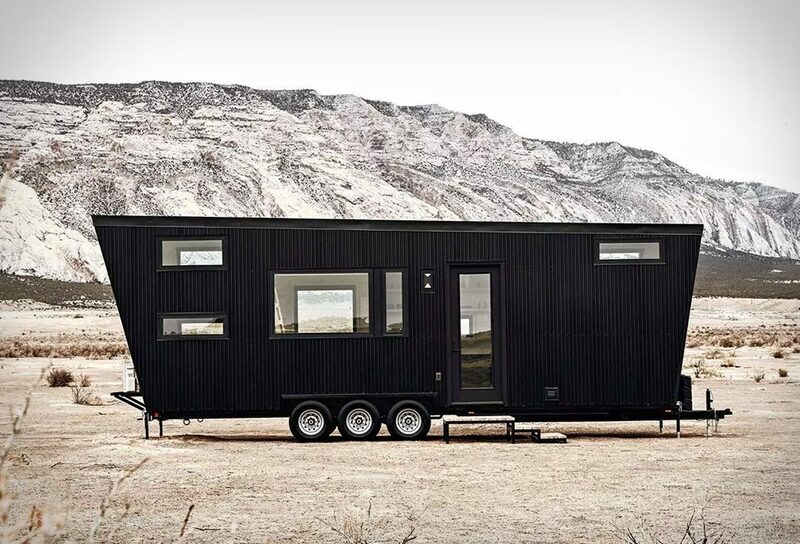 It might look like everyone’s favourite travelling scrap yard, but this isn’t Tatooine, and the Drake tiny house by Land Ark is anything but a home a for old robots. It’s a spacious home on wheels that has enough room for 7 people to live comfortably in it, and with two bedrooms and an office/third bedroom combo it’s hard to come up with an excuse why you wouldn’t want to live here. The inside of the Drake is stylish, fresh and clean looking. The two loft bedrooms are just the right size and boast amazing views from the high windows. There’s also a full kitchen with all of the mod cons, and a bathroom that has a shower, toilet and a bathtub! Grab the rubber duck Land Ark, we’re coming over to stay! 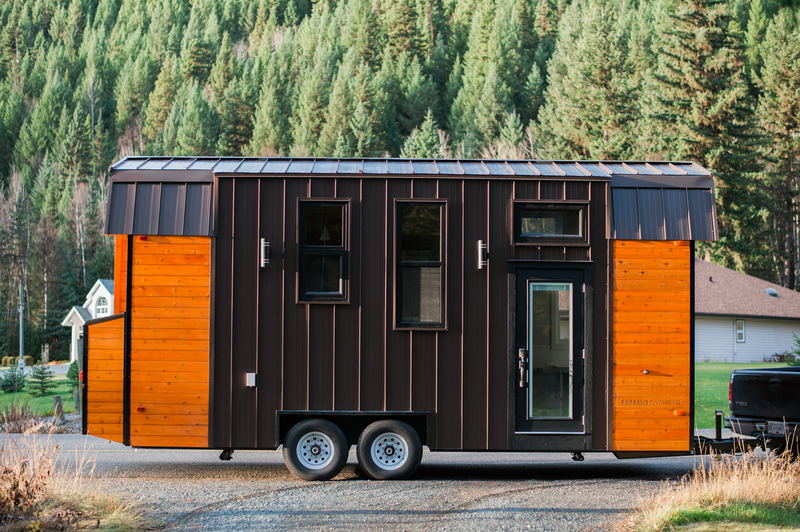 Our list of top tiny homes doesn’t just stop on the land! 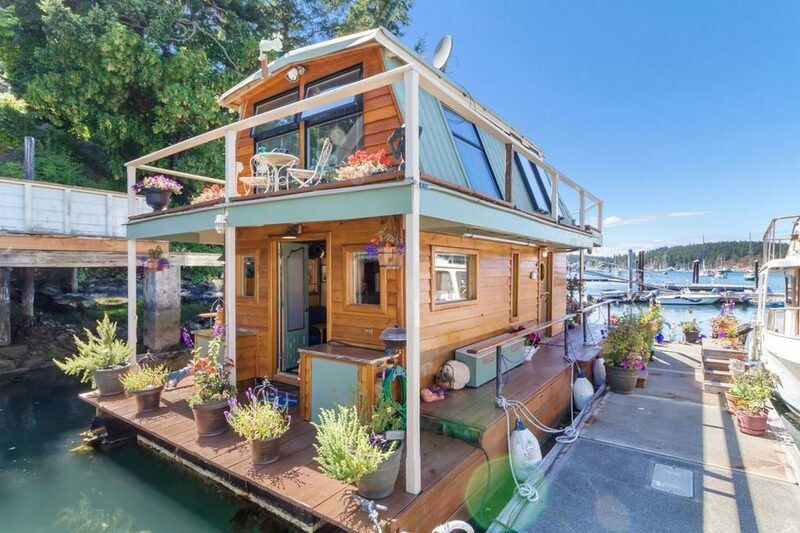 If you’re going to get fully into the Tiny House movement then you need to consider the possibility of living on water. 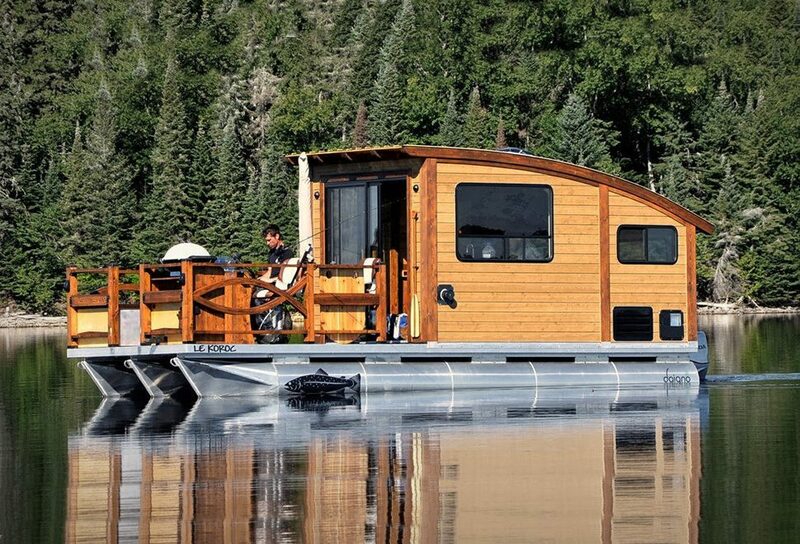 Meet Le Koroc, the tiny house boat from Daigno. They’ve taken the classic wooden style cabin of a narrow boat and pimped it up into a cosy floating home that’s a little bit smaller and easier to manage than the original quayside classic. Le Koroc is powered by a Honda VTEC engine and electricity comes from solar panels on the cabin roof. The whole build is very eco friendly, and Daigno make each model using innovative construction processes that revolve around a single-structure laminated timber. Three marine grade floats keep you above the water, which means you’ll only get wet when you decide to dive in and cool off. 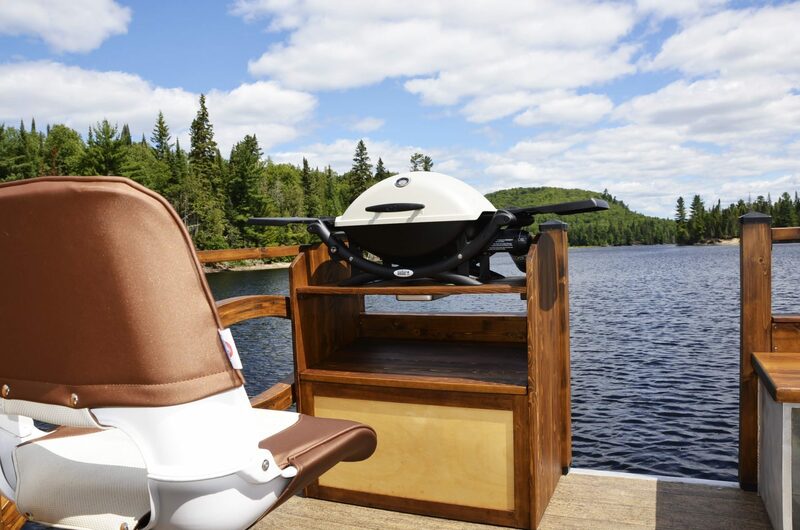 This tiny house can be equipped up for fishing or holidaying, and features a bbq on the deck, a full kitchen and bathroom, and a bed/table combo in order to save space. You can check out the official presentation for Le Koroc on the Daigno website! 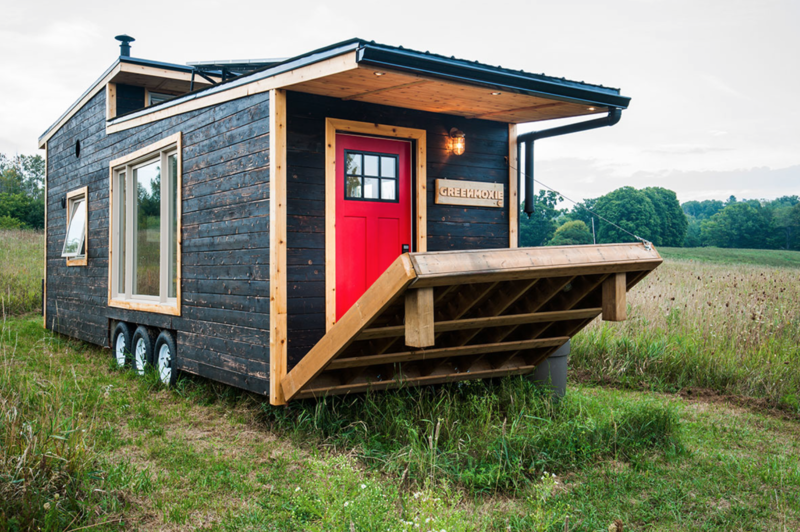 Keep Reading For More Of Our Top Tiny Homes! Looking for all the world like a souped-up teardrop camper, the Leaf House takes the country log cabin out of the forest and puts it firmly on the open road. 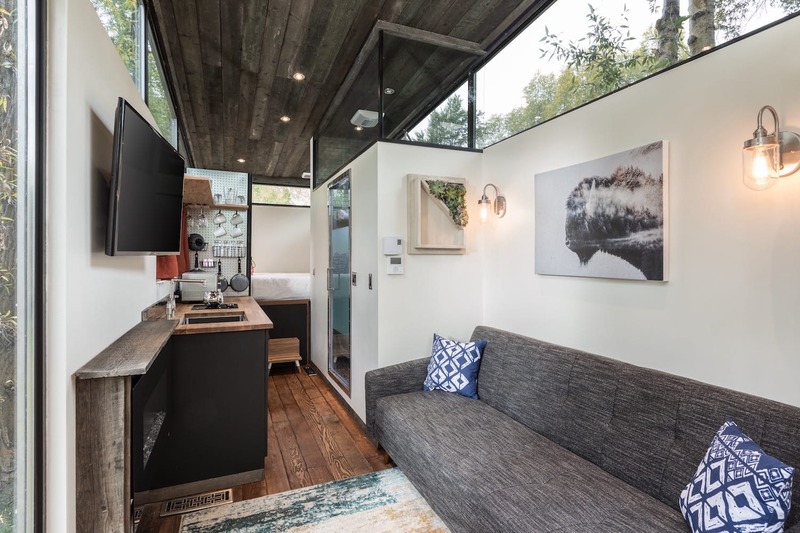 Designed in Canada and another example of an uber eco camper, each leaf house takes around 6 months to build and is completely built to the owners specification, meaning that just like snowflakes no two leaf houses are the same! 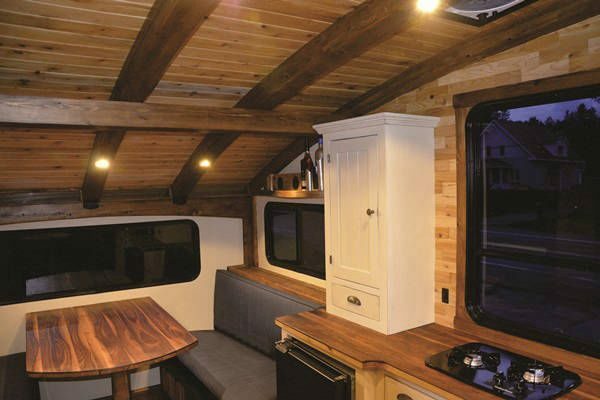 The inside of this particular leaf house looks pretty retro (although that could be the sepia photo), but retro works when it’s done properly – take the new Citroen Camper Van for instance, fusing new and old together seamlessly into a tiny home that really knows how to turn heads. Each Leaf House is built to fit on a trailer 16-20 feet in length and can weigh anything from 5,000lb to 20,000 lb depending on how much you cram into it. Leaf House aren’t a mass producer of top tiny homes; they build one or two a year, so if you want to get on the waiting list you better head over to the Leaf House website right away! We’re back to another tiny house designed for cold northern living. 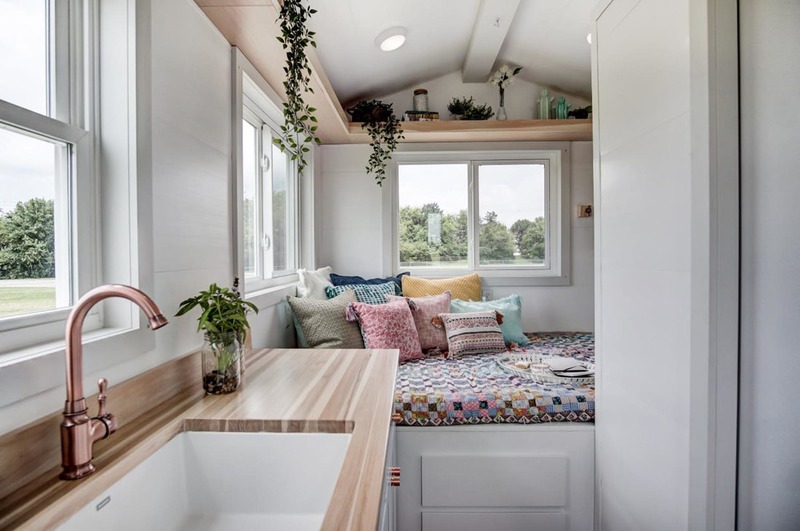 The Aspen from Borealis Tiny Homes is the second house in our top tiny homes list that you can comfortably ward off the cold in, and it does it all whilst leaving a tiny footprint. The heating in this off grid luxury home comes from the floor via radiant heating, and there’s an additional Lunos E2 heat recovery system and a gel fuel fireplace if you’re really feeling like turning it into a tropical paradise. Hot water is on demand and the optional extra of a composting toilet can be built in. 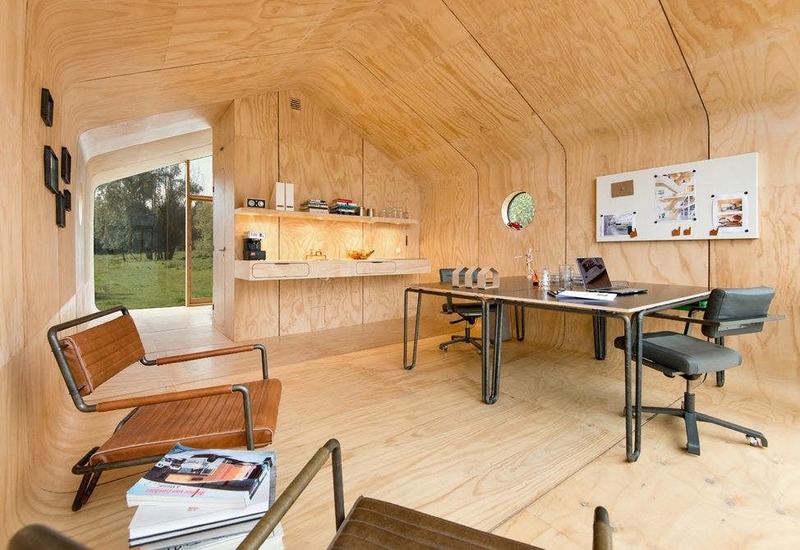 I know it’s my favourite phrase, but this tiny house is nicer than some of the student flats that I lived in, and they had three times the room that the Aspen has. Theres a place for everything and everything has its place; the mezzanine level bed can be accessed by jumping up onto the kitchen worktop, and it also has a full working oven and kitchenette area with a springy tap! There’s plenty of storage in the benches, and with two different levels you really get the feeling that this tiny house is bigger than it actually is! 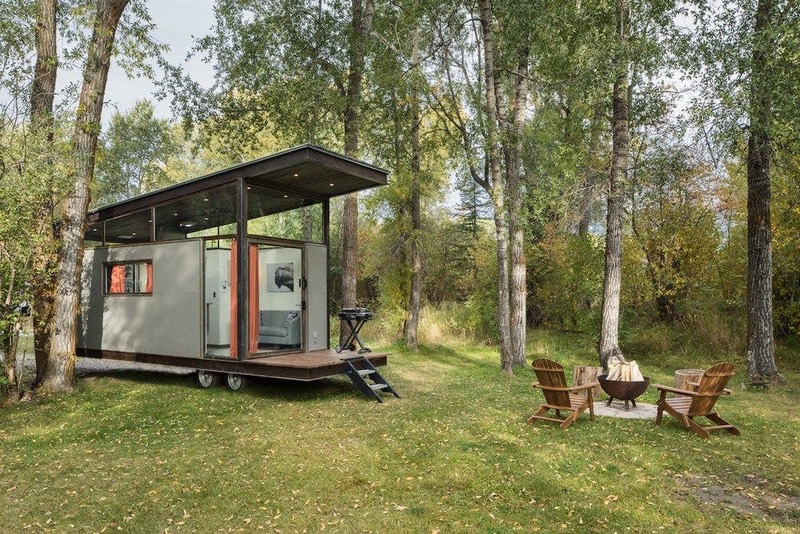 Check out the Borealis website to learn more about the Aspen Tiny home! If your looking for a two person home in a modern wedge-on-wheels then the RoadHaus could be one of the top tiny homes for you. 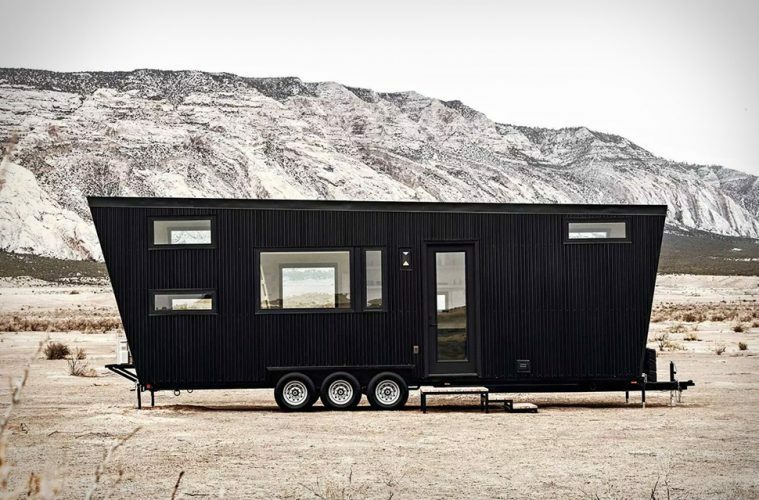 This is probably the only off grid home in our list that actually lives up to the name of a Tiny House. It’s relatively small (14.8 to 22.2 sq m), but the airy glass design and elevated ski-slope roof let in a lot of natural light, making it a cool modern home that feels spacious and relaxing. 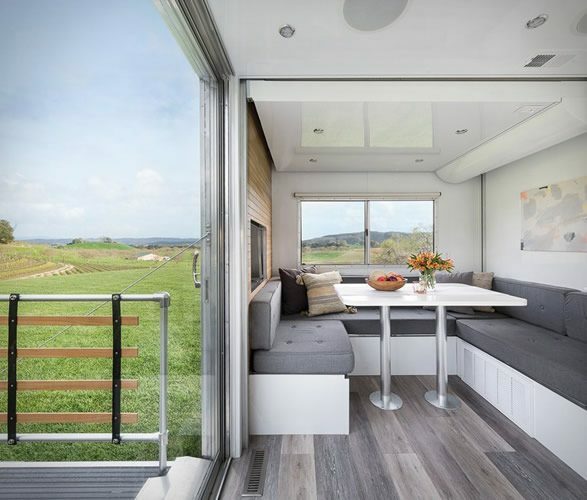 The RoadHaus is initially designed to gain power through an RV hook up, but theres plenty of scope for modifying it with solar panels or wind turbines – you’re going to need plenty of power to rock your new flat screen tv too! The kitchen and bathroom areas are all neatly tucked away with all of the utensils and utilities that you need to be comfortable whilst living off the grid. This pint sized power house can be yours for around $63,500, with the cost rising depending on how many optional extras you add into the mix. Check out the RoadHaus in greater detail by visiting the WheelHaus website. If the Le Koroc softly adapts the look of the iconic narrowboat, this next house on our top tiny homes list rips up the rule book and rewrites what it means to be a floating home. The second of our water based abodes was built in 1989 and takes up 600-square-foot of luxury living. 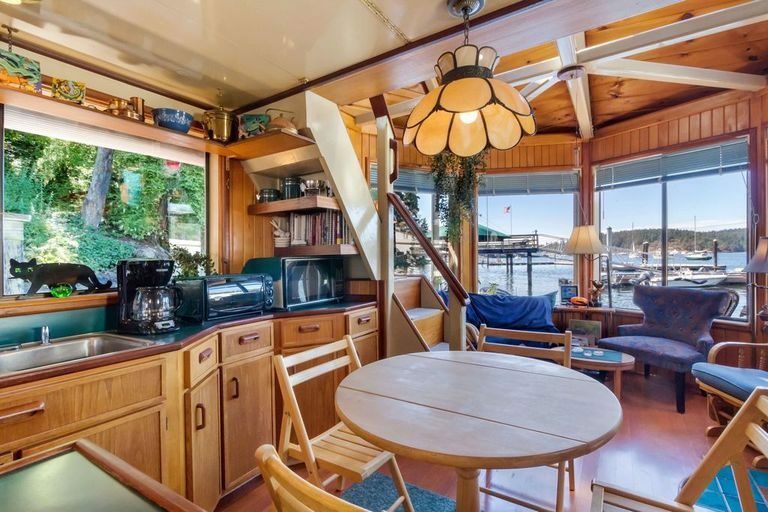 It’s currently docked in Friday Harbor, Washington, and could be at the top of your top tiny homes list for the princely sum of $550,000! 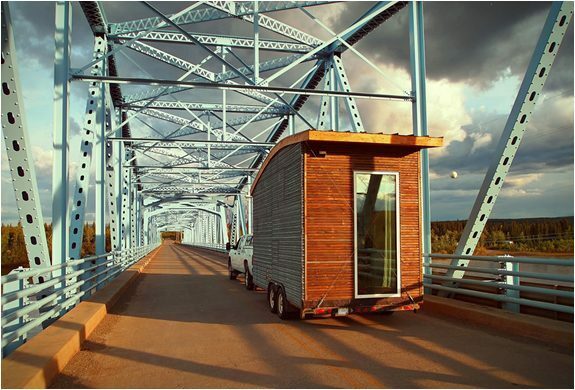 If the RoadHaus is the smallest tiny home that we’ve got in our list then the Floating Home is definitely the biggest. 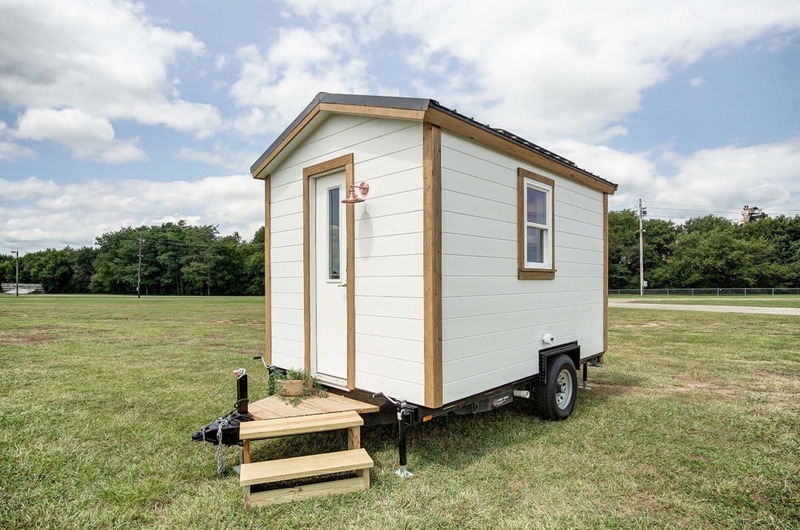 With a kitchen that wouldn’t look out of place in a rustic farmhouse and a solarium to boot, this tiny house packs a punch and still counts towards your goal of off grid living. With the whole ocean as your back yard the possibilities for exploring are also endless, and there’s more than enough room for all of your kayaks and wet suits. 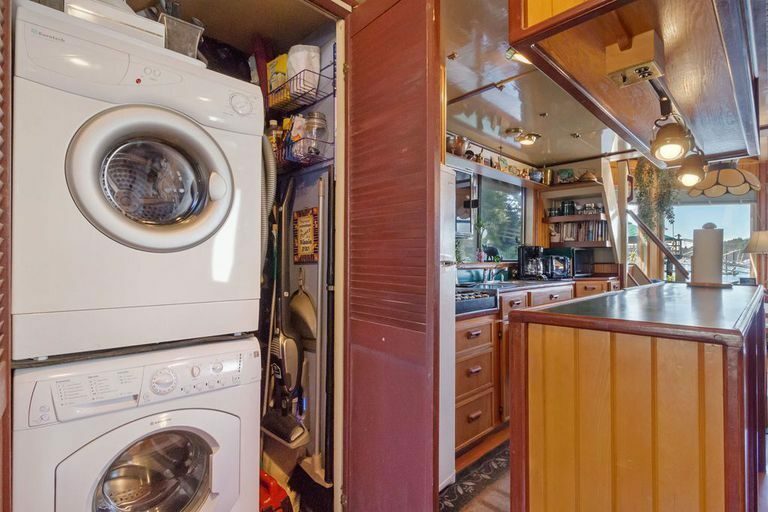 As well as a washer dryer combo, this tiny house has a full kitchen with island, living room, bedrooms, a coal fire and two decks with seating areas. There’s even a bath tub included too – with all of this water usage you’re going to need to start filtering the ocean! Have you ever dreamed of having your own mortgage free castle with a full working drawbridge. Well, this next house on our list of top tiny homes might not have turrets or canons, but you could soon be the king or queen of your own of your own off grid kingdom. 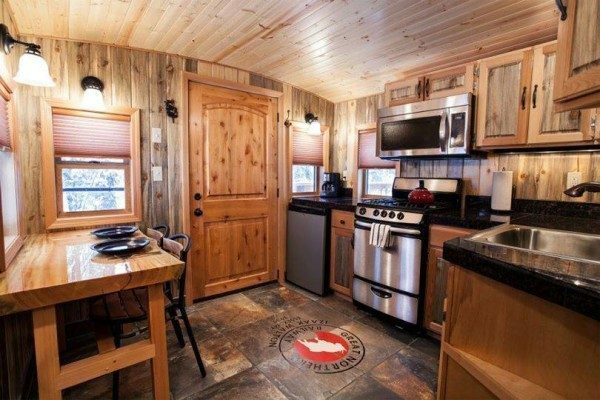 This GreenMoxie Tiny House is the bee’s knees, and a real log cabin fortress that will help you to fight off the daily grind. Functional, elegant and sustainable, this tiny home has everything from a log burning stove to a reclaimed 100 year old brass portal window (that’s one fancy feature!) 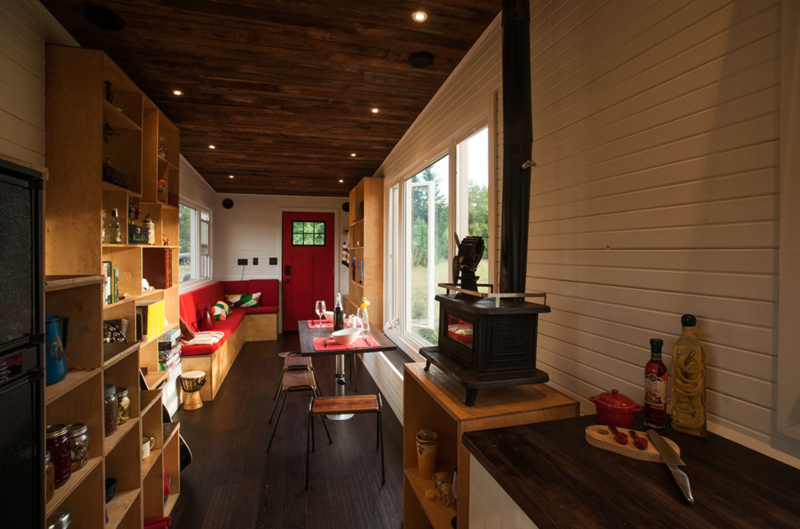 There’s a propane tankless water heater, a 200l rain barrel and a complete surround sound system – basically everything that you could possibly think of (within the realms of reality) is in this amazing tiny home. It’s light and airy, and works as both a weekend hang out zone or a permanent forest dwelling. Check out all of the amazing features, fixtures and fittings on the GreenMoxie website. 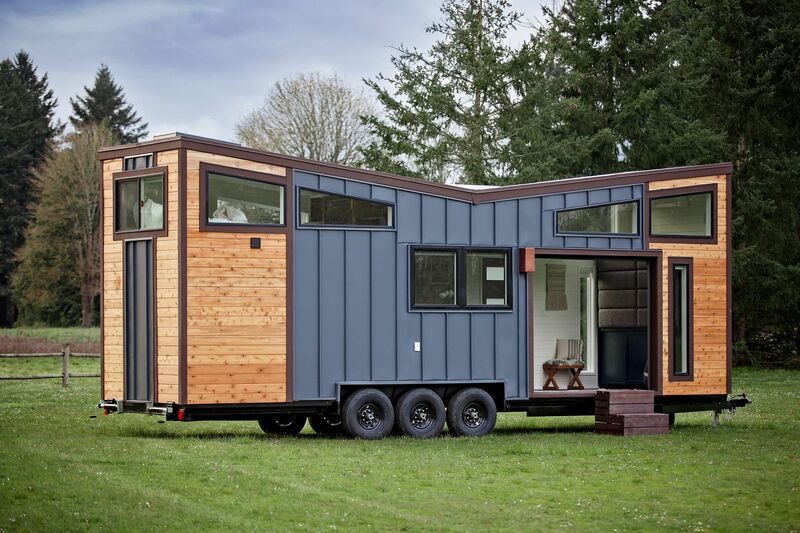 We never said that the top tiny homes in this list had to be able to be towed on a road! 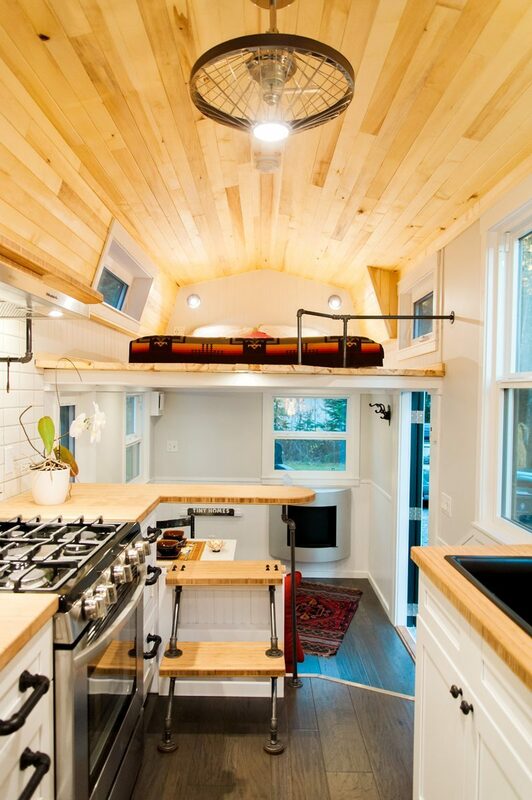 This converted train cabin makes an awesome house in the woods, and it’s been converted into a stunning tiny home by its owners. 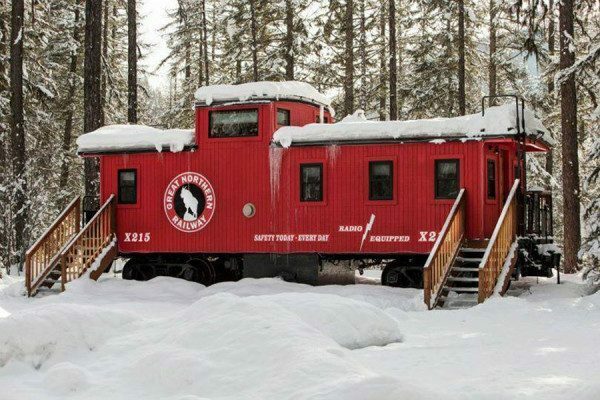 This caboose comes with a full kitchen (so you can still bring your XL Ridgemonkey along for the ride) a couple of cosy bunk beds, and a master bedroom that boasts an inviting gas fire and a queen sized bed. When you look at this picture you wouldn’t think for a second that you’re standing inside a train carriage; it’s a proper country kitchen and a real lumberjack style home, which could explain why there’s so much nice looking timber everywhere! These train houses might not be stopping off at any stations any time soon, but we’re definitely up for buying a ticket to stay inside one of them! 15. The School Bus…hang on? Ok, so this one isn’t quite like the typical school bus conversion that you all know and love, but I guess it shows what can be possible if you put your mind to creating an unusual looking home (although I’m not quite sure that this one would pass an M.O.T in the U.K though!). 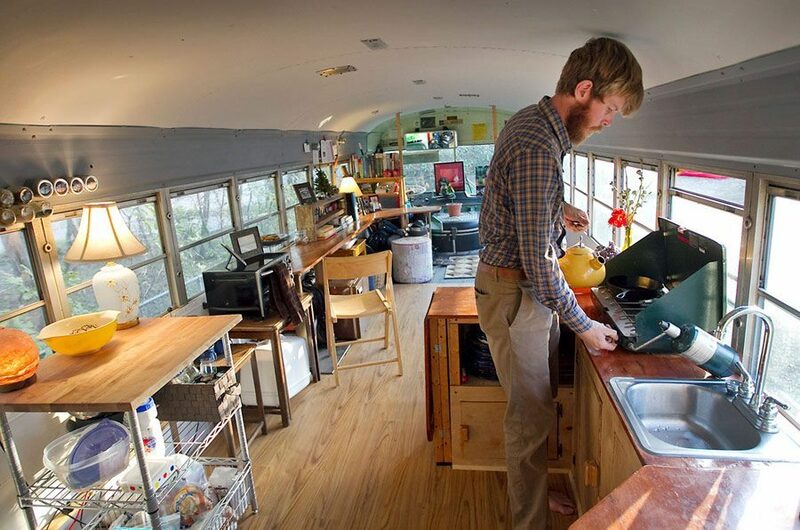 School Bus Conversions are a lot of people’s go-to starting points when they look to build top tiny homes, and if you look at the picture below it’s not hard to see why! A school bus is already long and high enough for you to be able to fit multiple appliances, fixtures and fittings into. They’re light and airy and the iconic look gives off a strong alternative living vibe. 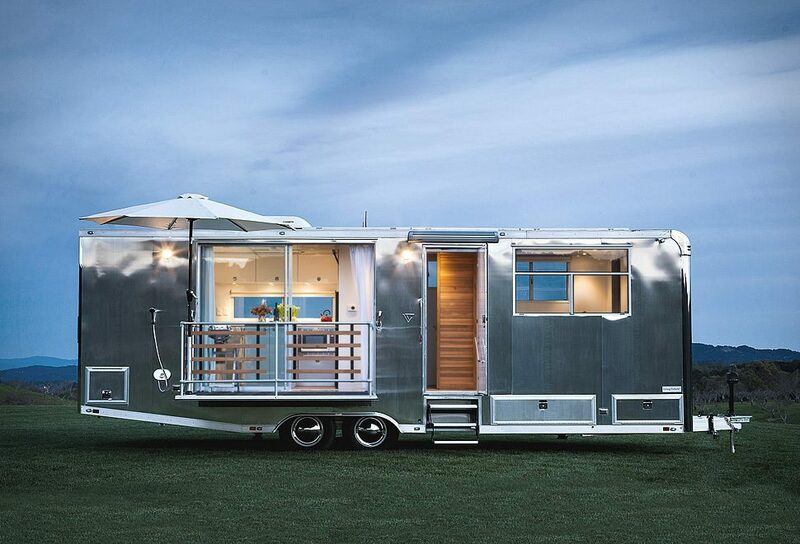 Like the classic airstream trailer, the domed roof gives you extra head room, and there’s enough exterior space to mount solar panels, rain collectors and outdoor showers too. 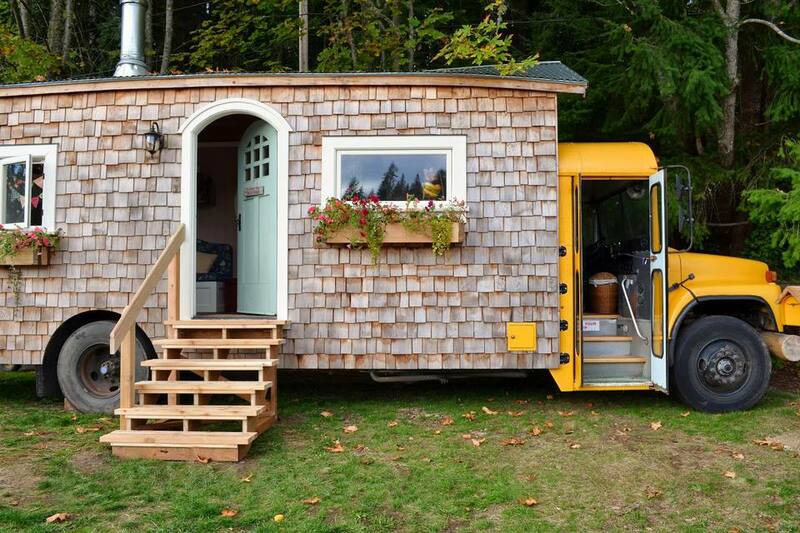 If you’re after the self built tiny home option then this could definitely be the way to go. Check out our School Bus Conversion article here for more ideas. It’s not really a mobile office, but it is my full time home. 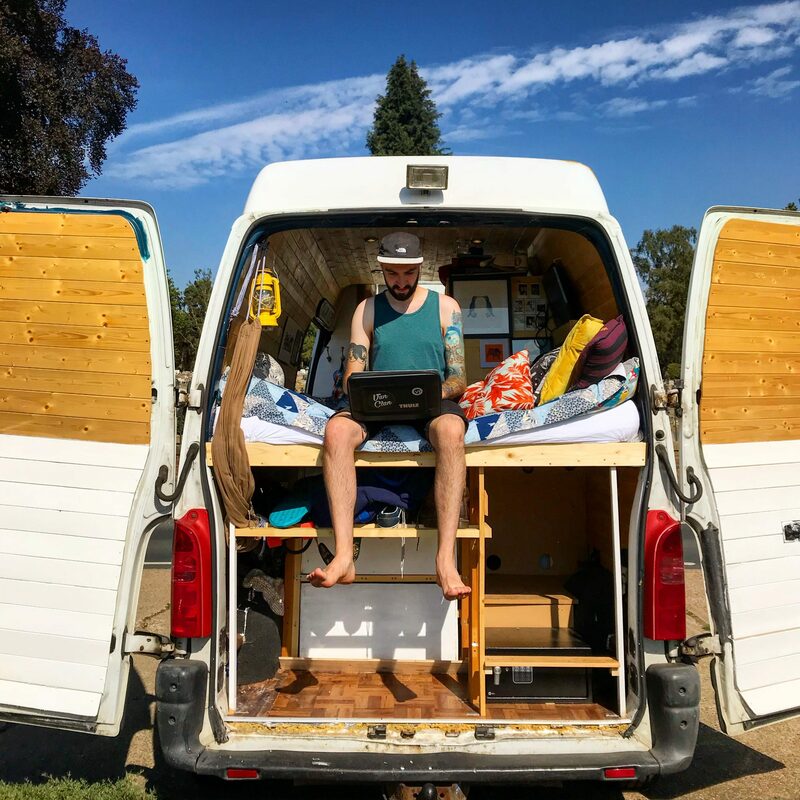 This is Vincent, the van that I live in with my Girlfriend Rose who also writes for Van Clan (check out her in depth interview with solo female vanlifer Lisa from Vacay Vans!) I’ve sat on the bed and written this entire article, along with many other articles for Van Clan, and watched the world go by from our sliding door. We’ve got two solar panels, an inverter, lots of storage space, a toilet, a wood burning stove and lots of other cool gadgets and top cooking accessories that we use in our every day lives on our Van Life UK adventures. We’ve been living inside 80sq feet for almost a year now and have been loving every minute of it. Feel free to drop us a message at @vincentvanlife on instagram, or visit vincentvanlife.com. Thanks for checking out our Top Tiny Homes list! 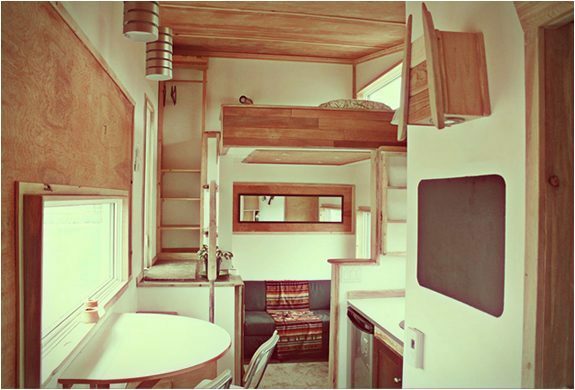 Be sure to visit the Van Clan homepage for more Tiny Homes and the latest Vanlife Stories! Owl Car Cam– The complete security solution for your camper. Titan Underwater Drone – Explore the ocean in crystal clear 4K HD.